As owner of an upscale doggy daycare and spa, animal-lover Sue Patrick pampers pooches for the most elite clients in Lewes, Delaware. Surely she can survive a week-long visit from Lady Anthea Fitzwalter, her well-to-do business partner from England. But before Sue can serve her guest a spot of tea, she discovers more-than-a-spot of blood inside the company van—and all over the driver’s dead body . . . I admit it, the collie on the cover totally sold me on the book. I've never known an actual collie but I've had a soft spot for them since the TV show, "Lassie", and reading (many times), "Lassie Come-Home". I did read the blurb, and it sounded appealing, so I requested the book. Sue and Anthea, owners of the Pet Palace and the leads in the story, were interesting and Anthea was a bit mysterious, though I did predict some of what would happen with her. They worked well together, trying to keep their business from going under and solving the mystery. The ending did somewhat come out of the blue but I enjoyed the mystery and the story. I loved the setting and seeing how the doggy daycare and spa worked. The animals themselves were not a major part of the story, which was disappointing. 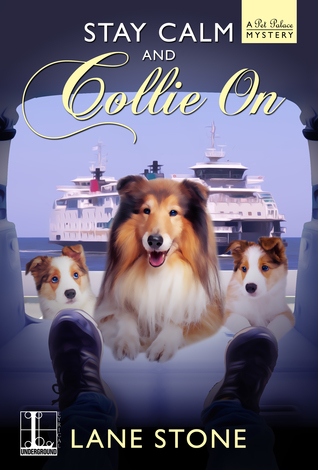 "Stay Calm and Collie On" was a solid story and a good start to the series. Again, I was sucked in by the cover. I only have one cat at the moment (pats Claude), but I am a cat lady in waiting, lol. Cats, estranged family, cats, a hint of paranormal, cats, and a hint of romance all added up to a story that was fun to read. The cats were a delight, even Lara's ghost cat Blue. I loved Lara's idea for a cat shelter and can't wait to see how it works in future stories. Lara's investigation was believably amateurish and she used her brain. With her aunt as a possible suspect, Lara 's motivation was completely believable. Less believable was how much time, and how easily, Lara was able to take off from work. It also was annoying how much she fussed about how she'd come up to visit Fran, even when obvious solutions were staring her in the face, nor did she make much effort to research options. "But you have to remember something-we don't know everything the police know. Whatever information we have is limited. Please, let the do their jobs, okay?" Of course, Lara keeps investigating but I was delighted to see that acknowledgement as so often in cozies, the police's work is ignored or downplayed. 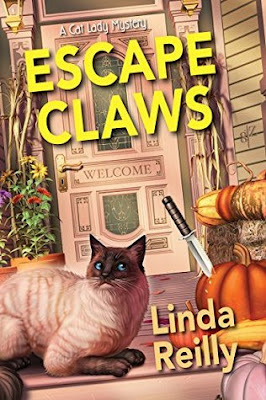 "Escape Claws" made good use of the animals and the mystery was tricky enough to keep me guessing.